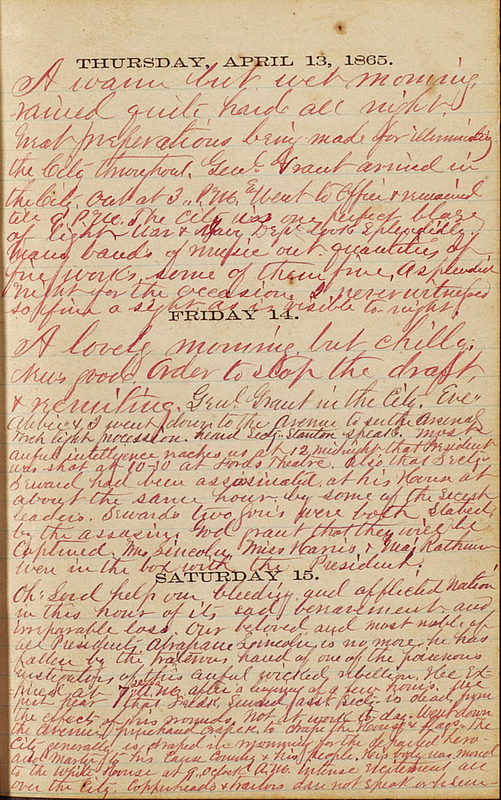 Manuscript item from “Pioneer Days in Florida,” the Otis Keene diary of 1865, April 15 to April 27, which reported the assassination, the funeral procession, the hunt for Booth, etc. Diary, correspondence. These diaries (1863-1894, 1903-1910) contain Keene's often terse entries about his daily routines from 1863, when he resided in Washington, D.C., through his years as a citizen of Jacksonville, Florida. They include his reaction to the assassination of President Abraham Lincoln. Unfortunately, the diaries do not cover the crucial Florida years of 1898 (Spanish-American War) and 1901 (Great Jacksonville Fire) but remain important as a local chronicle.